It's a little more than a week until Easter and time to get into the swing of things with some chocolate-laced recipes. The simple chantilly cream, chocolate sauce and candied macadamias are really handy dessert staples that have almost endless applications. 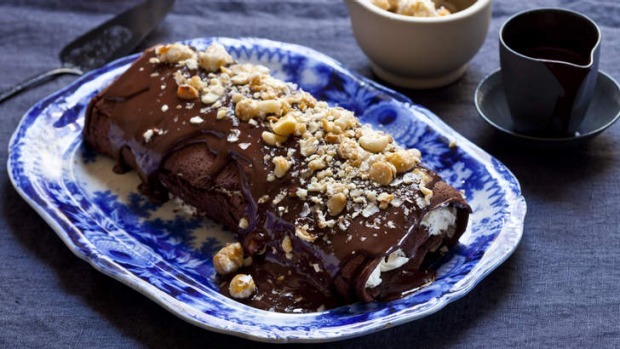 This rolled sponge with luxurious chantilly cream, dark chocolate sauce and crunchy candied macadamias makes a great centrepiece dessert before, after and during Easter. 1. Preheat the oven to 180 degrees. Line a 40x30cm tray with baking paper. 2. Place the chocolate in a large bowl over barely simmering water. Allow most of it to melt before stirring. 3. Take off the heat and add the butter. Stir through until melted and well combined. Keep warm. 4. In another bowl, beat the yolks. Add to the chocolate mix. 5. Beat the egg whites until foaming. Rain in the sugar gradually and continue to beat until you have soft peaks. Fold half the egg whites into the chocolate mix. Then gently fold in the rest of the egg whites until the mix is uniform but still light and fluffy. 6. Pour onto the prepared tray and spread with a palette knife or a spatula to about 2cm thick. Bake for 10 minutes. Remove from the oven and allow to cool. 7. Once cool, spread the chantilly cream evenly on top of the sponge, leaving a 3cm or 4cm border on the long edge furthest from you, and a 2cm edge on each of the two short sides. Roll the sponge away from you to form a roll, picking it up with the paper to stop it breaking, and peeling off the paper as you go. 8. Transfer to a serving platter, pour over the room-temperature chocolate sauce and top with the candied macadamias. 1. In a chilled bowl, whisk the sugar, vanilla and cream by hand (or use a machine but watch carefully) until you have stiff peaks, about three to four minutes. 2. Place the whole nuts on a tray lined with baking paper in the oven to warm up. 3. Place sugar and two tablespoons of water into a small pot and bring to a simmer. Heat the sugar to 120 degrees, then tip in the hot macadamias. Stir continually with a wooden spoon. The syrup will coat the nuts, then form into a white candy. Keep stirring until the sugar starts to caramelise and turn golden. Pour back on to the lined tray and allow to cool. 4. Break up in a mortar and pestle, or use whole. These store well in an airtight container for some weeks. 1. Finely chop the chocolate in a food processor. Tip into a bowl. 2. Bring the milk, cream and honey to the boil, then pour this hot mixture over the chocolate. Stir until smooth and shiny. 3. Slowly incorporate the butter until wellcombined and the sauce is smooth and glossy.